Removal ProcedureRemove the air cleaner assembly. Refer toAir Cleaner Assembly Replacement.Remove the intake manifold cover. Refer toIntake Manifold Cover Replacement.If equipped, remove the coolant heater.Remove the catalytic converter. Refer toCatalytic Converter Replacement.Remove the engine coolant thermostat housing. Refer toEngine Coolant Thermostat Housing Replacement. 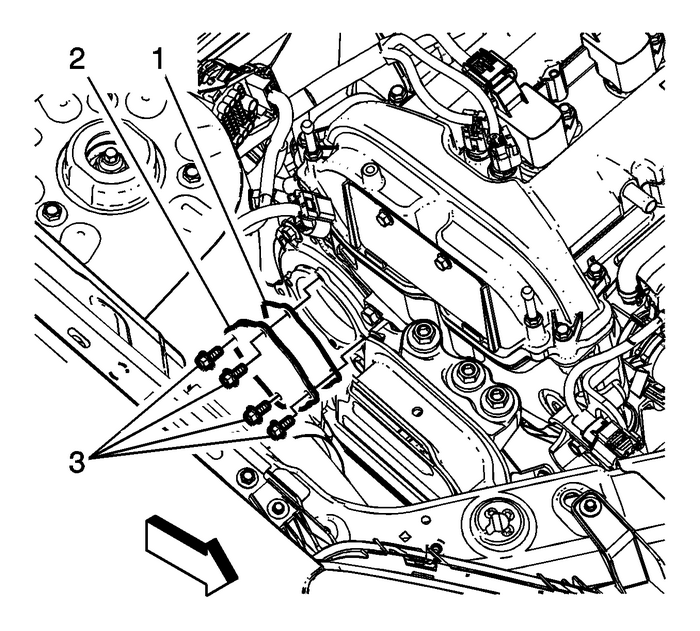 Remove the water pump cover (2), fasteners (3) and gasket (1) from the engine frontcover. 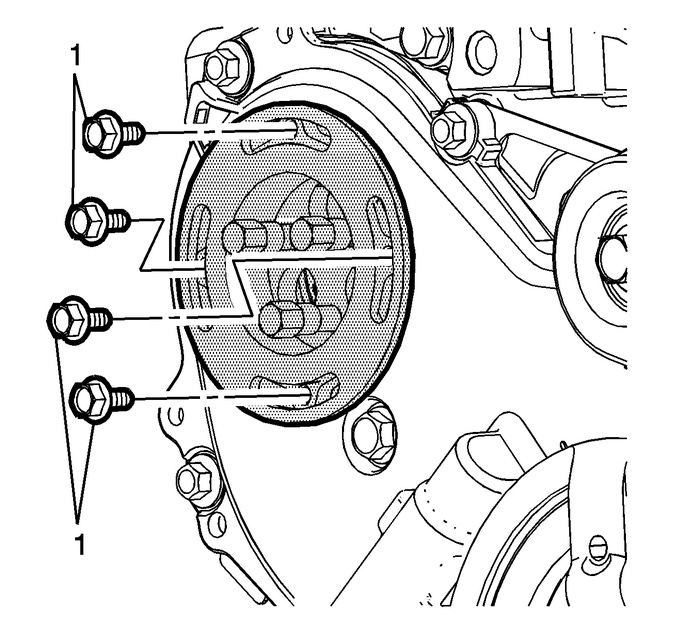 Note:A drain plug has been provided at the bottom of the water pump assembly for additionalcoolant drainage from the engine block and water pump. 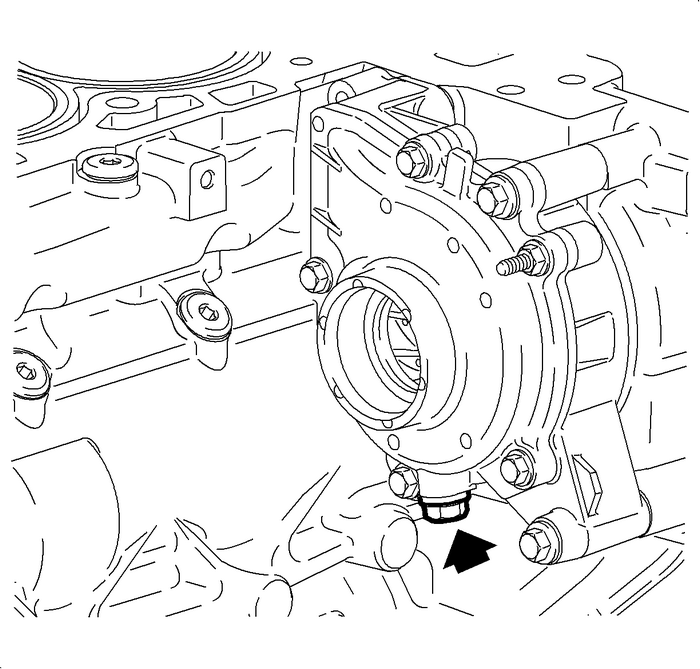 Drain the coolant from the water pump using the plug at the bottom of the pump. Installthe plug when finished. 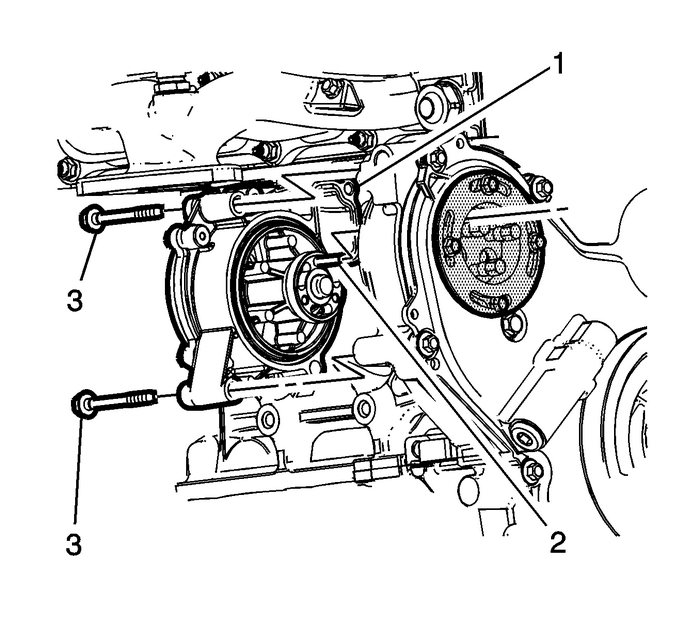 Note:The water pump holding tool supports the sprocket and chain during water pump service.The tool must be used or the balance shaft must be re-timed. 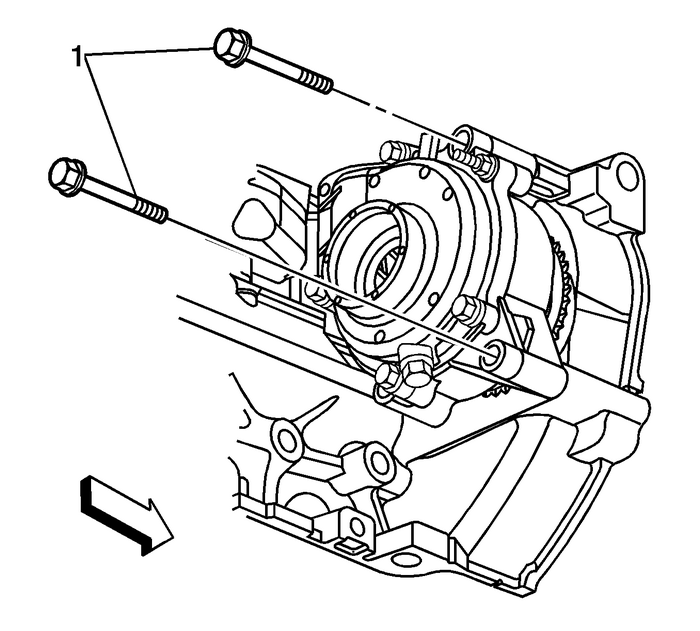 Align the EN-43651 water pump holding tool(1) with the threads on the water pump sprocket. Tighten the water pump holding toolfasteners (2). Secure the water pump holding tool with the previously removed water pump cover fasteners(1) into the engine front cover. Remove the water pump sprocket to water pump fasteners (1). 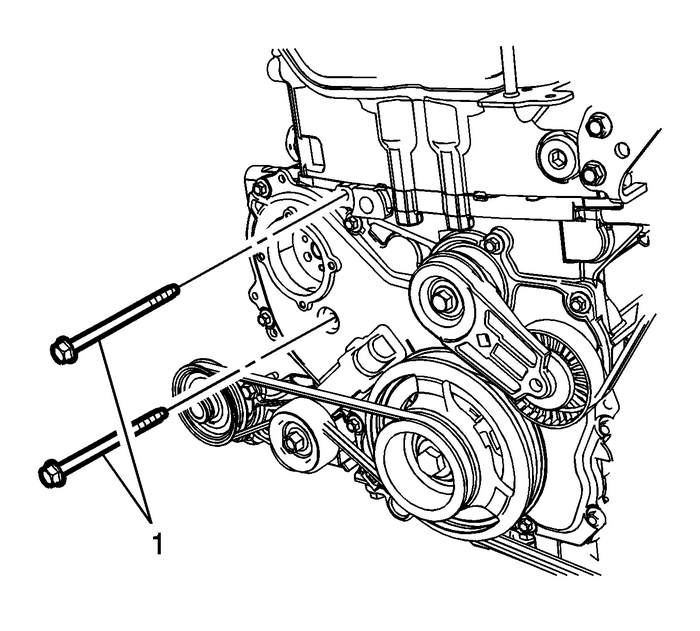 Note:Be sure to remove both water pump bolts from the front of the engine block. Remove the front water pump fasteners (1). Remove the rear water pump fasteners (1). Remove the water pump (1). If replacing the water pump cover (1), install a new O-ring (2) to the water pump(3) and tighten the fasteners (4) to 25-Y (18-lb-ft). 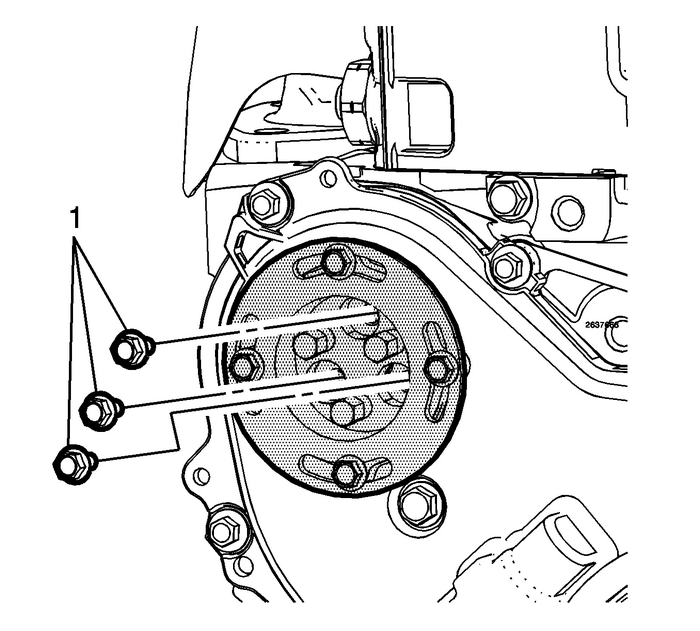 Note:A guide pin can be created to aid in water pump alignment. Use a M-6-m x 6-mm x 50.8-mmstud (2-in). Thread the pin into the water pump sprocket. 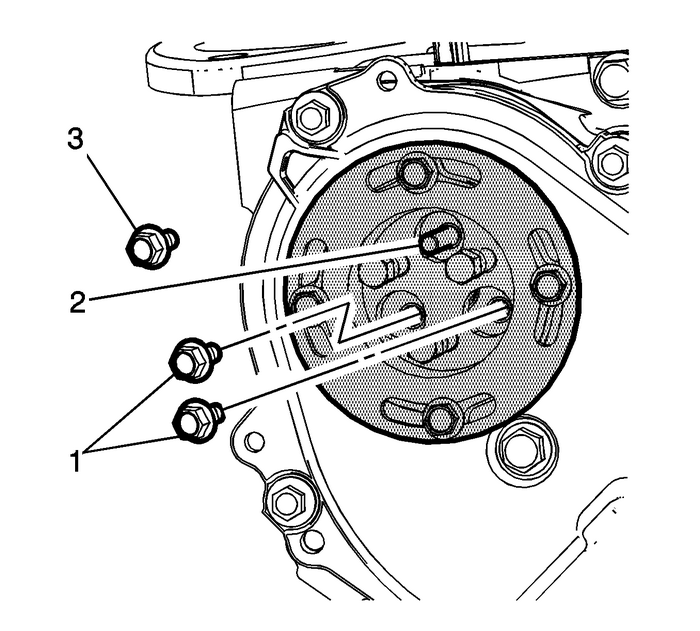 Using a guide pin (2), align the pin with the water pump holding tool.Position the water pump (1) against the engine block and hand tighten the water pumpfasteners-(3). 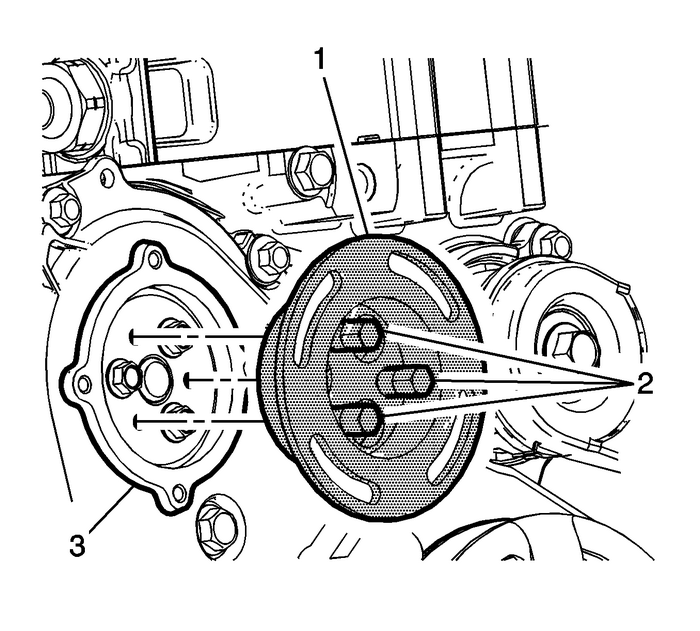 Install 2 water pump sprocket to water pump fasteners-(1). After the fasteners aresnug, remove the guide pin (2) and install the third fastener (3) and tighten to10-Y (89-lb-in). Install the water pump fasteners (1) at the front of the engine. Hand tighten at thistime.Tighten the water pump fasteners at the front and rear of the water pump to 25-Y (18-lb-ft). Remove the water pump cover fasteners (1) from the engine front cover and water pumpholding tool. 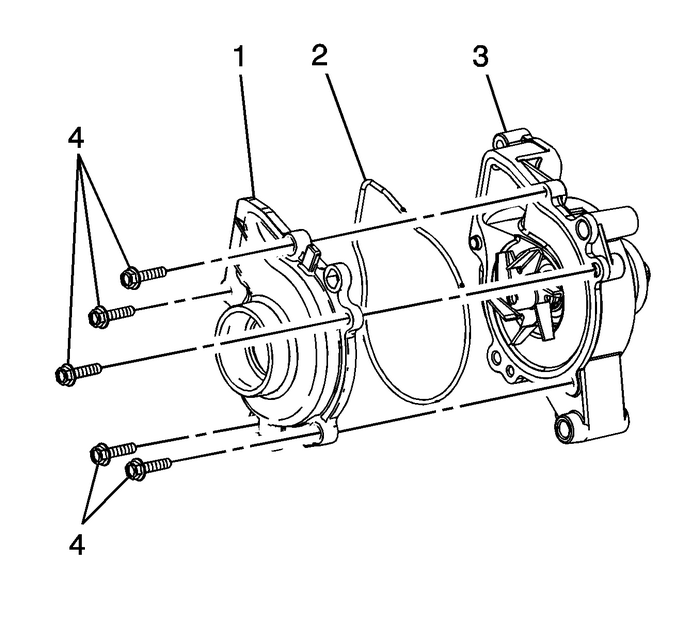 Remove the EN-43651 water pump holding tool(1) from the water pump sprocket. 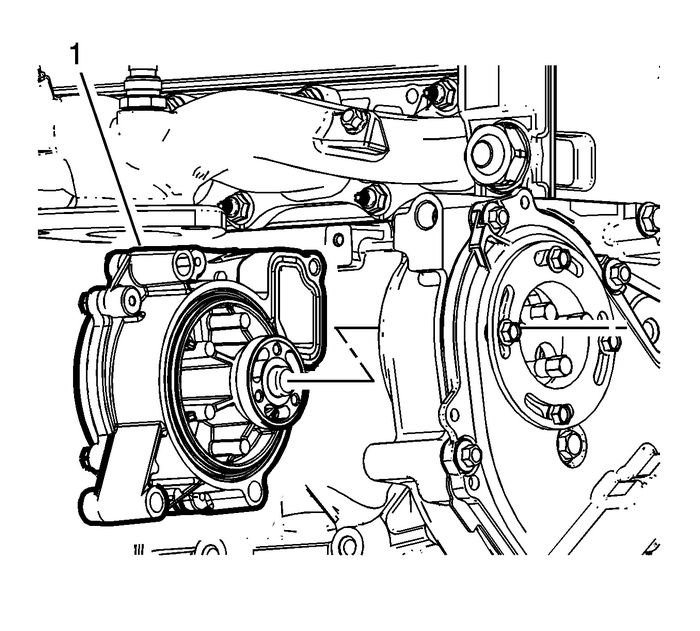 Install the water pump access plate (2) gasket (1) and fasteners (3) and tighten to10-Y (89-lb-in).If equipped, install the coolant heater.Install the engine coolant thermostat housing. Refer toEngine Coolant Thermostat Housing Replacement.Install the catalytic converter. Refer toCatalytic Converter Replacement.Remove the intake manifold cover. Refer toIntake Manifold Cover Replacement.Install the air cleaner assembly. Refer toAir Cleaner Assembly Replacement.Refill the coolant system. Refer toCooling System Draining and Filling.